A few weeks ago an interesting request came in by email. Could we, the person asked, add the ability to search Oliver + S pattern by difficulty level? I can be really thick sometimes. I saw the word “search” and started thinking about search algorithms and custom database fields and what would be required to recode the site to be able to do this. Then this week it hit me: why not “browse” by difficulty? Same difference, right? And that’s super easy to do. 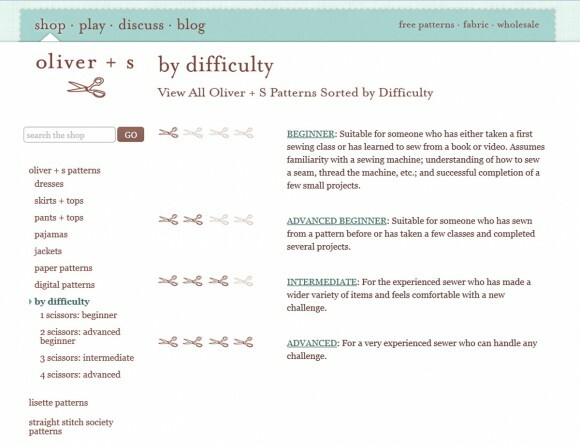 So we’ve now added the ability to view all our Oliver + S patterns arranged by difficulty level. This will give you an easy way of finding patterns that match your current level of sewing expertise. You can use this approach to select styles that will help you work through projects sequentially to help build your confidence and skills. Remember Liesl’s popular Lean to Sew with Oliver + S syllabus from three (!?!) years ago? This new way of viewing patterns allows you to see all our patterns at the skill levels she mentioned back then. It also expands the selections of styles to sew at the skill level that’s right for you. We hope this will be a helpful enhancement for you. i was going to email the same request! this is great – thank you! Nooooooo! No four scissors! I think the Fairy Tale Dress is the closest we’ll ever get to four scissors, with so many steps and details. Anything beyond that would enter the realm of couture. And about 12 of you would buy it. But I’m flattered that you ask! I guess I should never say never, but I CAN say not anytime soon, if I can help it. Dana, that’s an interesting comment. We’ve talked about that quite a bit over the years, and we think pretty much the same. It’s not an issue of difficult as much as one of the time required. You’re definitely one of the faithful! Hmm, I’m certainly obsessed! How about 1 four scissor pattern per year? To keep the faithful at bay! now you’ve gotten us in a 4 scissor frenzy. It’s the white whale of O+S sewing! lol. I am in the twelve, without doubt! Yes another “twelve” here too! We need one for pure enjoyment. I’m in the twelve too! I would probably buy a 4 just to see what it looked like. And I too think that it is more time than difficulty, because honestly, I have bought patterns, not trusting my skill level, and found that with the directions it was easy peasy. Just maybe time consuming! After working with O & S, my perspective on sewing is that I can do ANYTHING with good directions, except pattern drafting as there are none! I mean last week when I was trying to buy my Fall 2013, I wasn’t sure if I had an account, or if I had just bought from the site without an account for prior purchases. It was a Saturday, and by Sunday Todd had answered my question, so I could make my purchase. Who emails on a Sunday morning to answer a business question? I realize this means you eat, sleep, and breathe your business. But I am thankful you guys are so responsive and listen to us. Just another reason I say, BUY these patterns; you get your value in every penny and then some. You might have to change the “12” to 20…..or 50 😉 I’d totally buy a 4 scissors; in fact, I never even notice or pay attention to the skill level ratings. There might be more seasoned, highly-skilled seamstresses out there buying your patterns than you think! First, let me say I adore you, your patterns, and your incredibly company. It’s funny because I was just thinking this summer how I would LOVE to sew a level four pattern with you as my guide. I can’t possibly think of what exactly that garment would be (I’m sure it would have to be for girls or women because female patterns are always more complicated) but I honestly would sew it no matter what were. I’ve been reading a couture pattern book but I would much rather start down that road with you holding my hand! Popping in to say when I first discovered Oliver + S I had never sewn before. Even the lazy days skirt had me scratching my head! I have now made several 3 scissor patterns (jump rope, school days, birthday party, playdate), with no real issues! Of course all that is thanks only to Liesl! !